Stealing Sheep's Not Real is forerunner for poolside jams. Stealing Sheep are writing music for the future, now. The Liverpool band's remarkable new album, Not Real, is a marked change for the group in sound and storytelling compared to 2012's Into the Diamond Sun LP. One of the trio's very gifted hallmarks has always been their delicate interplay of vocal harmonies -- harmonies which are ever so present on the new album as well, but with a heavy change on instrumentation, style, and varied film and musical inspiration taken from the likes of Maya Deren, Delia Derbyshire, Grace Jones, and John Carpenter. The change also brings a kind of clarity to the group's evolving sound, which on previous releases was more evocative of neo-folk and psychedelia. The new album still has those psychedelic and dreamy elements but now it's as if their stories were written to stretch time on the ribbon of an old cassette tape set to a neon '80s pop-group Dada-vibe where "Dada is [definitely] anti-Dada!" with more focus on experimentation, timing, with more synthetic and electronic elements. The band recorded the album in their own studio and came up with ideas as they went. This method created a sort of demo process to lead the direction of the album using their inspiration to create more collages of sound, "experimenting with tuned percussion, programmed beats, trigger samples and effected synths." For Not Real, the package is two-fold: art/experimentation and music/experimentation that features accompanying video and artwork (a collaboration between the band and photographer Charlotte Rutherford and collage artist Louise Mason), that refracts reality as much as it takes it in. The new songs want the listener to question what is fact and what is fiction; writing lyrics that flit and waver on the edge of the dream vis-à-vis the reality-scape and questioning how we can move past the limits of a reality that might not always be as set in stone as we might think. On the catchy track, "Deadlock" the lyrics ask; "Who's making decisions for you in your life? / The engine's turning 'round, but something always holds you down / Finally look within but see yourself looking back / When will you get a grip and take hold of yourself?" while in album opener "Sequence," we are only a number or part of a sequence ourselves. On "Greed," "sometimes the truth is hard to find / but it's always there, baby, disguised," the band reaches deep into the psyche to question "do you seek the truth / or live the lie" - how do you live your life and how does it work in your relationships? When is what you want different from what you should take? There are some deep questions here if you take a moment to listen to what the album is saying. Stealing Sheep has given this album so much texture, power, and thought that their dreams may only be the jumping off point for more of their visionary and grand ideas. 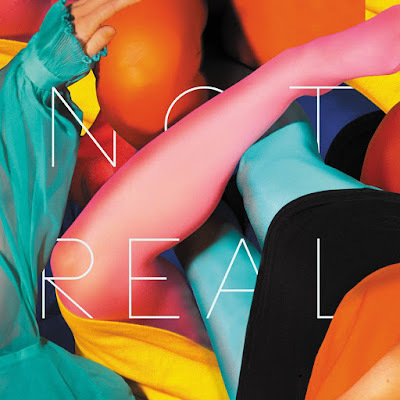 Highly (and thoughtfully) recommended, Not Real is definitely a forerunner for summer poolside (neon cool) jams. Listen to Stealing Sheep on Soundcloud.